ART & LIBERATION! This exhibition will showcase ephemeral works focusing on the diverse and individual experiences of mental health conditions and artistic expression. Open call out for submissions of sketch books, notes, diaries and art showing the importance of creativity to the mind. Focusing on the diverse and individual experiences of mental health conditions and artistic expression. All levels of artwork will be accepted for the submission and exhibition. "ART & LIBERATION!" Exhibition will take place at The Holy Biscuit 4th - 19th Sept. Preview night Monday 3rd Sept 6-8pm. Deadline for all applications is 23rd July at 6pm. If successful all artwork must be received before 6th August to prepare for exhibition. 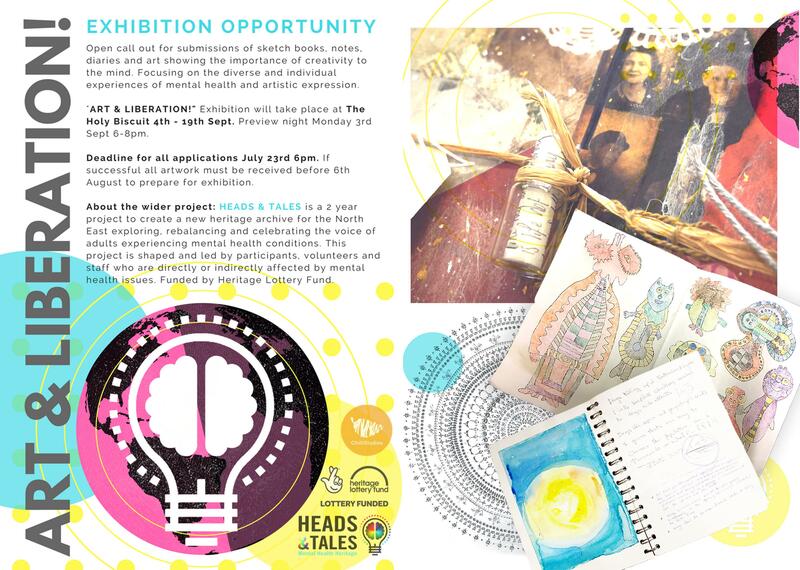 About the wider project: HEADS & TALES is a 2 year project to create a new heritage archive for the North East exploring, rebalancing and celebrating the voice of adults experiencing mental health conditions. This project is shaped and led by participants, volunteers and staff who are directly or indirectly affected by mental health issues. Funded by Heritage Lottery Fund. If successful all artwork must be received before 6th August to prepare for exhibition. nothing other than your own postage if needed. Preview night Monday 3rd Sept 6-8pm.